Home » Custom Project Portfolio » Everything else! Get ready for spring! 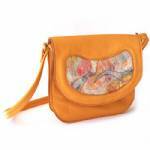 Golden yellow leather purse with handmade art-felt inlay and turquoise accents. Full leather lining, interior zippered pocket, key leash with snap, and zippered front pocket. Solid brass hardware. The main compartment is about 8" wide, 7" tall, and 1 1/2" deep. It is large enough to hold a checkbook wallet, Kindle Fire, an average size e-reader, or most smart phones.